He may not want to admit it, but it looks like the vice president has a big move in the works: Mike Pence just made an official statement denying that he is laying the groundwork for a 2020 presidential bid, despite the fact that he opened a 100-story Pence Tower in midtown Manhattan this morning. Wow. Election day is still more than three years away, but things are already heating up! 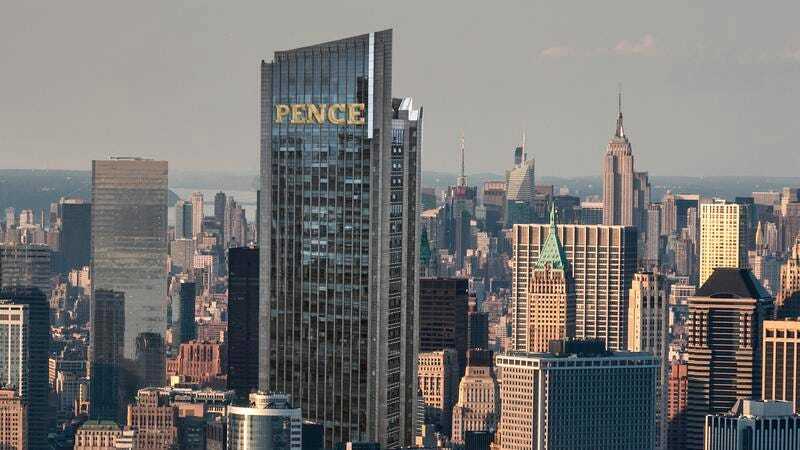 The brand-new, shimmering gold Pence Tower stands just blocks from Trump Tower, and at 1,147 feet tall is almost twice its size. Despite what seems like an obvious show of posturing, Pence insisted in his speech at the grand opening that the unveiling of the tower was not intended to establish himself as a successful billionaire real-estate mogul for a presidential run. He instead focused on the deal-making prowess he used to get a zoning permit for the enormous skyscraper, which he admitted is a good skill for a president to have but also is totally beside the point of Pence Tower, which contains dozens of high-end condominiums as well as a full-service restaurant called Pence Grill. Interesting. There’s definitely something going on here. Donald Trump had better watch his back!